THE NUN is a gothic horror film set in 1952 Romania after World War 2, where the bombs dropped on an abbey have uncovered a portal where evil can emerge from another world. It is a spin-off of 2016’s The Conjuring 2, (the nun is CONJURING 2 has a cameo in this film – not that anyone can remember or recall what she looks like) and the fifth instalment in The Conjuring Universe. The film, believe it or not is English director Corin Hardy’s second film. It begins in 1952 with a character saying the demon in the painting is real. 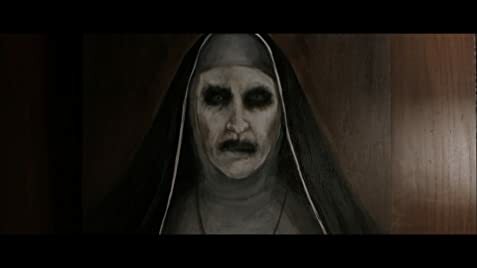 There is no reference to this painting or this demon in any other part of the movie, The film continues with a group of nuns in abbey in Romania (don’t ask why Romania) where they walk carrying kerosene lamps in dark corridors before encountering a sign saying ‘God ends here’. This follows by a nun committing suicide and the body found by a French Canadian called Frenchie (Jonas Bloquet) (his name is later revealed as Maurice – no kidding), though this character speaks with a distinct European and not a Quebec French accent. 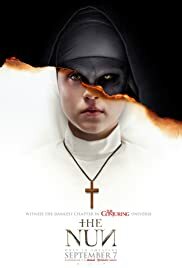 A Catholic priest, Father Burke (Demián Bichir) is dispatched from the vatican and together with a Catholic noviciate (Taissa Farmiga, younger sister of Vera Farminga) are sent to Romania to find out what is going on. The folk’s funniest moment is Frenchie saving the movie nun’s life. “It is called the kiss of life,” he tells her after. “Thanks for saving my life, she replies. The film cost $22 million to make, which is a lot considering that the film is such a mess. Judging from the last 15 minutes of the film’s climax, never has a film been so incoherent.